This contemporary outdoor club chair is infinitely cool. 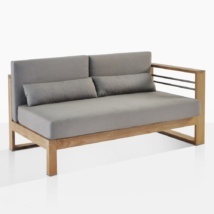 The industrial elements work handsomely with the A-Grade teak and the square sharp lines. 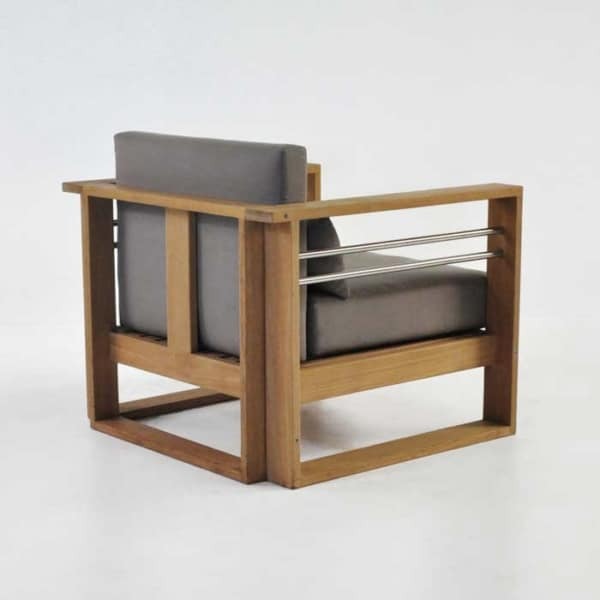 While many pieces of teak furniture are purpose-built to handle outdoor applications, this contemporary outdoor lounge chair is seemingly able to wear both hats (indoor and outdoor) because of its calm, cool looks. 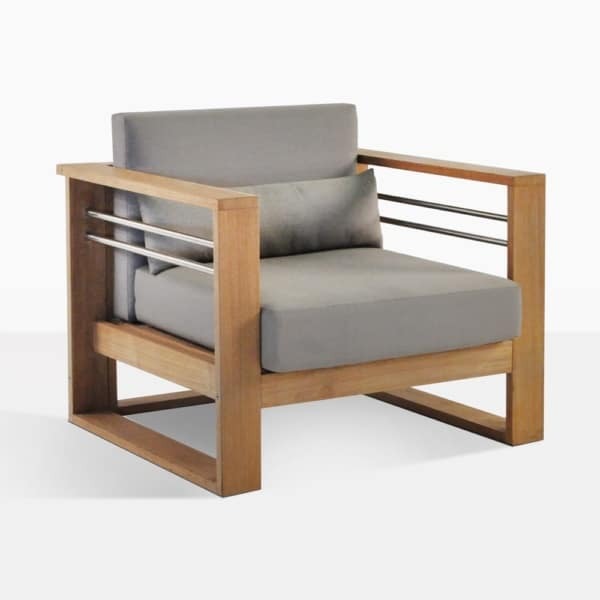 The Pacific Teak Outdoor Club Chair will look amazing wherever you decide to put it, with it’s warm and elegant teak wood, and the accompanying brushed stainless steel architecture. The smooth cool finish on the 316 stainless steel (marine grade) compliments the dapper appearance of this collection, which features a very contemporary styling. In loft settings with a backdrop of red brick walls or raw concrete floors, this piece would be a standout. But don’t forget the heritage of teak furniture: this contemporary club chair was built for the outdoors. One could imagine it on a high-rise patio or in a nicely groomed backyard. The Pacific Club Style Outdoor Club Chair has a generous feel, but a surprisingly minimal footprint, like all the best club chairs. While it isn’t covered in leather like many traditional examples, the materials used to make this contemporary club chair are second to none. The Sunbrella® fabric gives consistent good looks year after year with the fade free characteristics, and the comfort of this outdoor lounge chair is more than you’d expect from something that looks this good. 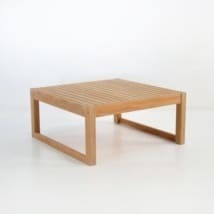 The 6 inch seating cushions and the 4.5 inch back cushions (as well as a perfectly sized lumbar support) are included free of charge and enhance the athletic and clean-cut looks of this contemporary teak outdoor lounge chair. 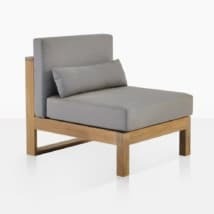 The star of the show is the fact that this contemporary outdoor lounge chair accomplishes everything that a more stereotypical club chair does, as well as being everything that a contemporary chair is. The design cues, the build quality, the materials and the usability of this piece all speak to the core concept behind creating this chair. 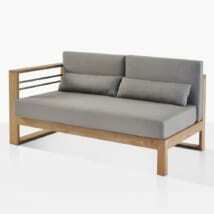 One need not buy furniture that is only good looking, or only comfortable. With this contemporary club chair you get a roomy feel and a small footprint. The 16 inch high seat level makes this the perfect chair for so many different settings. The Pacific Outdoor Lounge Chair is very tasteful, but also has a hint of rawness from the exposed stainless steel pieces. 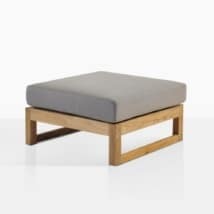 The upright posture of the chair and the square design make this an excellent place for prolonged sitting without going overboard on the relaxation aspects. This contemporary Outdoor Lounge Chair is part of the “Pacific Collection” but it could easily find a home on the patio of a Chicago high rise or a hip NYC rooftop. A modern home in Pebble Beach California also offers an excellent backdrop for the Pacific contemporary lounge chair. 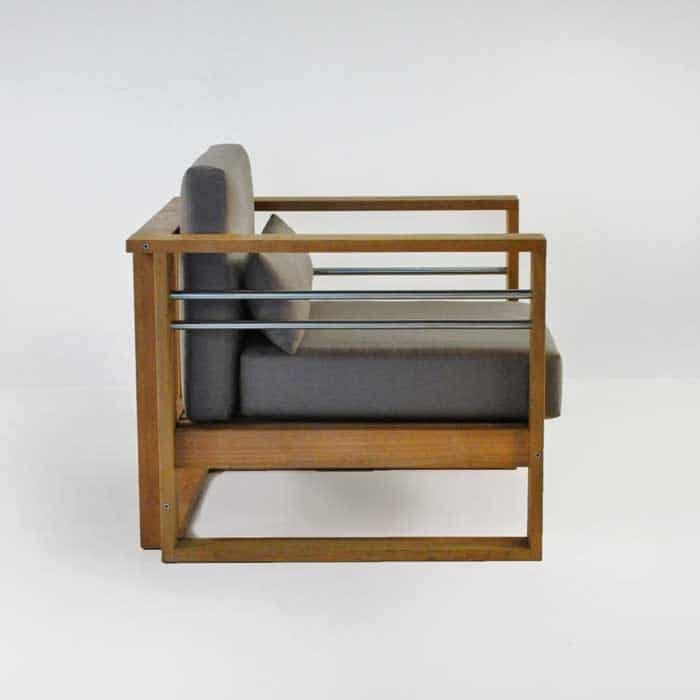 It doesn’t have a hard time fitting into a simpler setting either; a desert-scape in Phoenix or Taos could also play host to this versatile and edgy chair that still has the core principle of relaxation in its DNA. The point, perhaps, is that if you like the combination of cool stainless steel and warm, golden A-grade teak, as well as wonderfully contrasting Sunbrella® fabrics, you have a perfect outdoor lounge chair.